For your tougher projects, you need more horsepower, versatility and, of course, comfort. The XU5065PS delivers on all fronts. 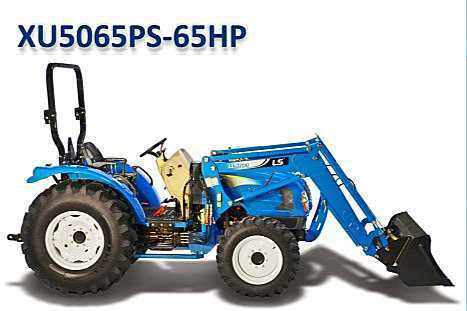 With over 18% more engine horsepower and nearly 15% more PTO horsepower, the XU5065PS 4WD utility tractor powers through tough soil conditions, cuts through thicker brush and pulls heavy loads up steeper grades by reducing the need to operate at a slower speed. Fully synchronized gears allow changes without stopping. The power shuttle shift transmission allows going from forward to reverse with the simple move of a hand lever and without depressing the foot clutch pedal. And more operating speeds, more front end loader lift capacity, selectable independent or manual PTO, 2 rear remote valves, and extendable lower links help you get your work done more efficiently. The XU5065PS is powered by an innovative, eco-friendly, TIER 4 engine that delivers powerful , smooth and quiet performance. Carry heavier loads than competitive models with the 3,065 lbs. of front end loader lift capacity. The loader is not only self-leveling, but is quick attach and come standard with the grill guard, skid steer coupler and bucket. Depending on your operation and needs, you can easily select between independent or manual PTO with the turn of a switch. Two sets of rear remote valves allow quick and easy attaching of hydraulically operated implements like rakes, backhoes, wood splitters and more. The extendable lower links makes changing 3-point implements a lot simpler. For the ideal combination of power, functionality, and comfort, the XU5065PS delivers a lot for a lot less than you might expect. The large 15.8 gallon capacity fuel tank provides long operation times. Standard 7 Pin Electrical Socket - provides power for implements when needed.